In this section I’m going to walk through utilizing the workflow I created to initiate a Tintri Snapshot on your Virtual Machine. 2. Have a Virtual Machine in vCenter which is running on the Tintri VM Store. 3. Import the latest Tintri Workflow Package I created and uploaded to FlowGrab. It would take far too long to go into all the details of snapshots and how they work, so instead I’m going to refer you to this PDF from Tintri. This gives a detailed overview. However, to be a little more clear, the workflow we are executing here is going to complete the equivalent of selecting a VM in the Tintri GUI and selecting “Take snapshot…” as shown in the image below. Note, that these snapshots will NOT appear in the vSphere client UI. This is expected. If we want to view all the Tintri snapshots upon the VM, we can also select “View snapshots”, and the list will be displayed. So we have a great feature within Tintri, but we don’t really want to go to the Tintri UI every time. By having the vRO workflow, we can execute them directly from within vCenter or as a Day 2 action within vRealize Automation. After importing the package you should see some additional vRO workflows and actions. As you can see there are 2 SnapVM workflows. 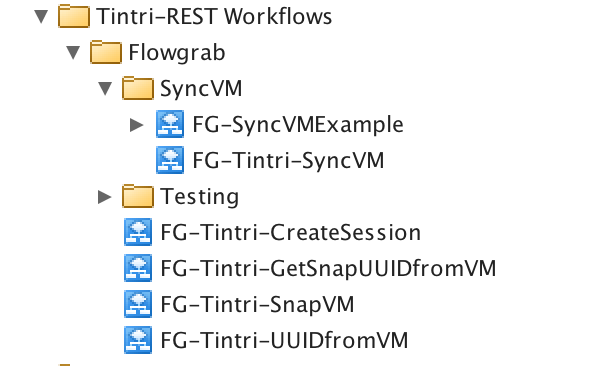 The “FG-Tintri-SnapVM” workflow just encapsulates the action “tintriSnapVMfromUUID”. The 2nd workflow “FG-Tintri-GetUUIDandSnapVM” combines all the workflows from Parts 2 and 3 to create the REST session and get the Tintri UUID. As a general rule I try always create the “lego brick” workflow, and then create a larger workflow to wrap all the pieces I need. I include them both, as there may be creative workflows you want to create and need to do multiple snaps etc. Run the vRO workflow and put in your REST Host, VM, and Snapshot name. Check the logs to verify you received a successful snapshot creation. The number that is returned at the end is actually the Snapshot UUID from Tintri. If you login to Tintri you should see your snapshot listed in the GUI. In addition if you browse to “https://YourTintriIP/api/v310/vm” you will see this listed as the current latest snapshot for your virtual machine. That’s it. 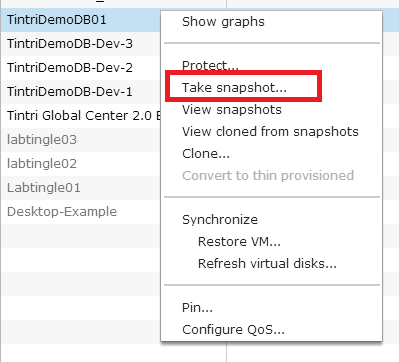 You can now successfully Tintri snapshot your VMware Virtual Machines using vRO! At the end of the series I’ll be showing how to add these to vRealize Automation as Day 2 Actions. In this section I’m going to walk through utilizing the workflow I created to get the Tintri UUID from a VMware Virtual Machine. Why do I need this workflow? In order for us to be able to perform any actions against VMs from the Tintri perspective, we need to know the UUID of the VM. This workflow allows us to get it. 1. Completed Part 2 verifying that you can create a session to your Tintri VM Store and are able to return a JSESSION ID. 2. 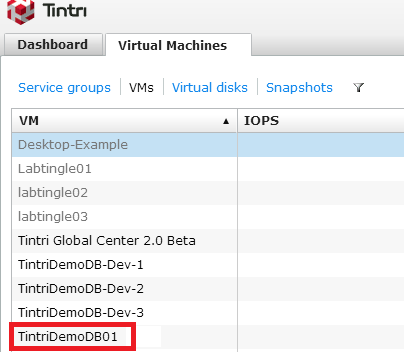 Have a Virtual Machine in vCenter which is running on the Tintri VM Store you tested in Part 2. What is the Tintri UUID? The Tintri UUID is the unique object identifier for which we need to reference when performing any Tintri operations against the Virtual Machine. This is how Tintri sees the virtual machine as opposed to VMware which uses the Managed Object Reference for the vCenter object. If we take it a step further and look at the Tintri API in your browser, you will see that Tintri has both values for the VM. The VM MOR, and the Tintri UUID. Our goal here is to get the Tintri UUID, so we can perform REST operations against it, like Snapshot, Replication, and Sync VM which are in the next set of posts. Once imported you should see some additional vRO workflows, and Actions. If you look in the workflow for Tintri-Session and Get UUID you will notice that this workflow includes the workflow from Part 2a for Creating the session as well as the other workflow we just imported. We first run the Create Session workflow, store the JSESSIONID as a general attribute, and then run the GetUUID fromVM workflow using the JSESSIONID we stored from the previous workflow. Run the workflow and select a Virtual Machine. Check the logs and make a note of the MOR and UUID. Take a look in vRO at the VM from the inventory view and should see the Managed object reference matches the VM you selected. Take a look in the Tintri API from your browser, and do a search for the MOR. You should see the matching Tintri UUID there as well. 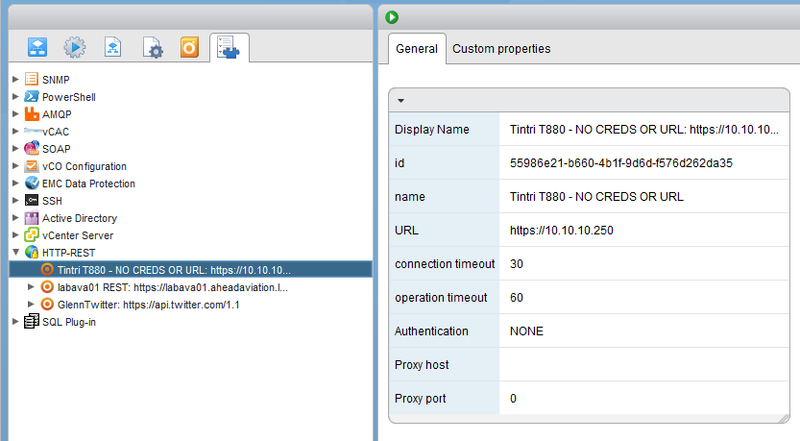 Now we are able to successfully get the UUID, we can start to perform Tintri actions upon the VM using vRO. In the next part of the series we will be going through executing a Tintri Snapshot on the VM. Part 4: vRO workflow: Tintri Snapshot a Virtual Machine – coming Tuesday May 26. In this post I’m going to walk you through utilizing the vRO workflow I’ve developed for creating a Tintri session over REST. This is the first workflow in the series, and without it, none of the subsequent workflows can be utilized. In order to complete REST requests against the Tintri API, an authenticated session is required. This workflow authenticates with the Tintri REST API, and returns the JSESSION ID. This JSESSIONID variable is then utilized for each of the REST requests in the next set of operations. 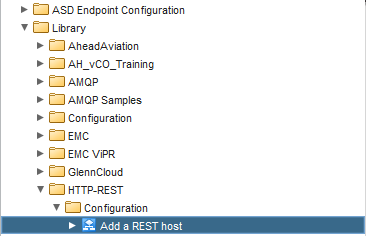 First of all make sure you have the vRealize Orchestrator REST plugin installed. The REST plugin should have been configured automatically when you installed vRealize Orchestrator. 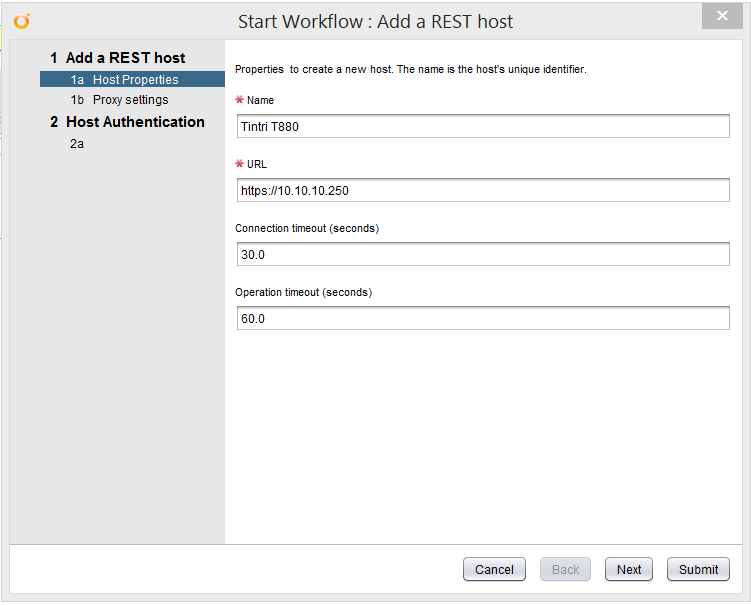 Run the “Add a REST host” workflow to add your Tintri VMstore. If like most users, you have more than one Tintri appliance, go ahead and repeat this process to add all of them. If everything is successful, you should see your Tintri Host listed in your inventory list. Import the workflow package you from Flowgrab. The FG-Tintri-CreateSession workflow uses the action and configuration elements discussed below. Right now, you will only see the tintriGetSession action item highlighted below. This is the action item which returns the JSESSIONID. The configuration element was created to store the Tintri UserName as opposed to storing it directly in the vRO workflow as a general attribute. Select the attributes tab, and input your password for the admin account. Step 3: Run the workflow and verify we can create a session! Now for the fun part! 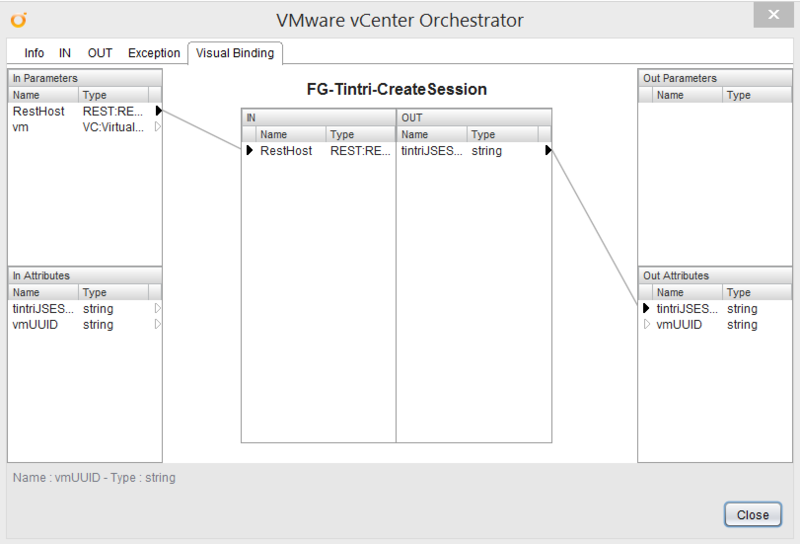 Run the FG-Tintri-CreateSession workflow. Select your REST Host and click submit. Check the logs and verify you got a status code of 200 which verifies the session was successfully created, along with the JSESSIONID. Congratulations, you were able to successfully authenticate with your Tintri VM Store using the REST API. 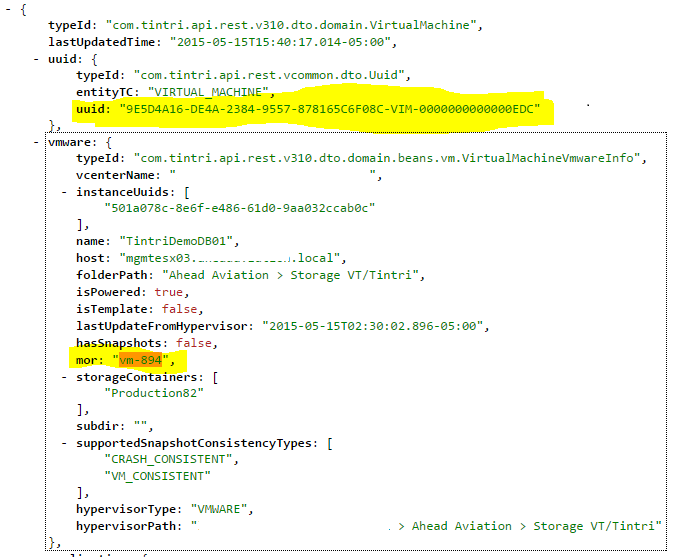 Part 3: vRO Workflow: Get a Tintri UUID from vCenter VM Object – scheduled for 05/20 – stay with me! 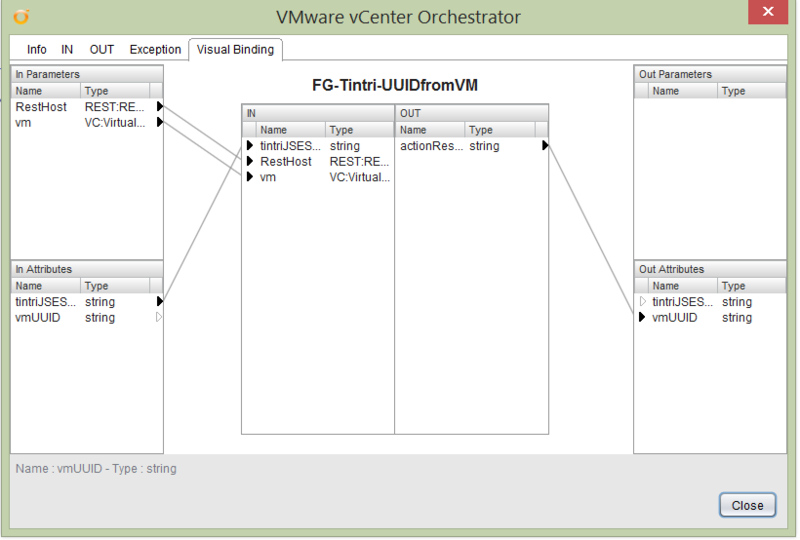 This next workflow allows us to select a Virtual Machine from vRealize Orchestrator, and returns the UUID from Tintri. Part 2b: Tintri-CreateSession vRO Workflow Code – Go here if you want to see the code and how this was all created – scheduled for 05/21 – stay with me!